Your favorite childhood story is back in Disney’s life-action adaptation of the classic story Aladdin. Featuring Naomi Scott as Princess Jasmine and Mena Massoud as Aladdin, this musical prepares to sweep audiences into a whole new world. The brand new trailer, released March 13, opens with Aladdin sprinting through the town’s square, mirroring the original scene from the 1992 animated musical film. Much like Beauty and the Beast (2017), Aladdin (2019) appears to have the same plot as its animated predecessor, with perhaps a few differences. 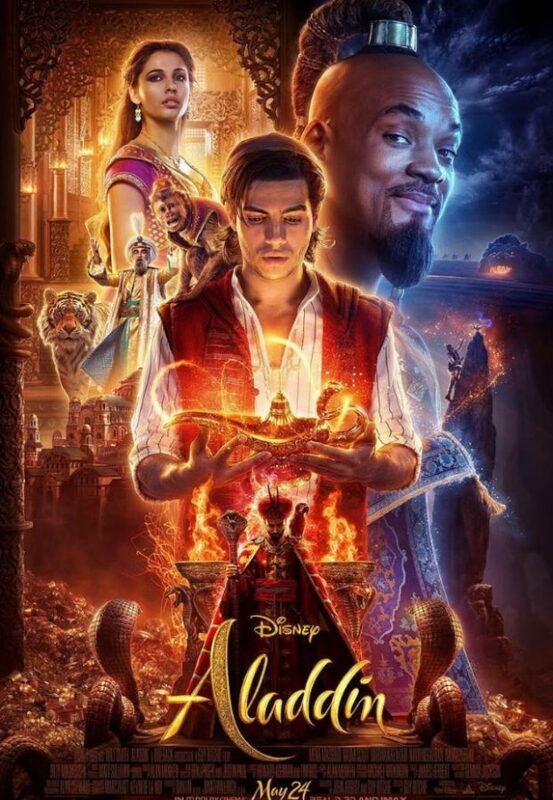 Aladdin (2019) has giant shoes to fill after Aladdin (1992) holds a strong 94% on Rotten Tomatoes. As well as its rating, Aladdin (2019) has iconic characters to stay true to. The original Genie, voiced by Robin Williams, became a legendary role for the deceased comedian, and some people have expressed concern over Will Smith taking on the role of the Genie in the live-action movie. “[Will Smith] does have big shoes to fill, because Robin Williams is and forever will be the best Genie, but I think Will Smith will do very well,” Lopus said. Beyond the controversy over casting and plot, most people are just excited to see a Disney classic come to life again on the big screen. Other Disney animated films, such as Dumbo and The Lion King, are also hitting theaters in 2019. “I believe they should keep doing remakes because it is fun to see cartoons play out in real life and it brings back your childhood in a way,” Lopus said. Aladdin will be released in theatres in May.